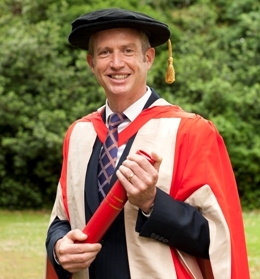 Universities can offer vital support and expertise to businesses, said Paul Lindley, founder and CEO of Ella's Kitchen, as he received an Honorary Degree from the University of Reading today. The University was delighted to make the award of an Honorary Degree of Doctor of Laws as part of the University's summer graduation ceremony, in which 3,500 new graduates are rewarded for their hard work by officially receiving their degrees. Paul Lindley founded organic baby food manufacturer Ella's Kitchen in 2004, following his experiences in bringing up his own two children, Ella and Paddy. Ella's Kitchen has achieved phenomenal growth in just seven years. The company has a presence in eight countries and by mid-2011 had a 14% market share of the UK baby food sector, making it one of the fastest growing companies in the UK. The University of Reading has played an integral part in the success of Ella's Kitchen, which is based in Henley-on-Thames. The original products were trialled in the Food Process Research Centre housed in the University's Department of Food & Nutritional Sciences. Working with Dr Susan Matos in Reading's Knowledge Transfer Centre, Ella's Kitchen began a collaboration with Reading academics that saw the development of a multi-sensory marketing approach for enhancing children's enjoyment of healthy food. A further project with academics in Food and Nutritional Sciences has helped transform the company's approach to sourcing raw materials - helping them maintain their consistent high quality finished products - as well as bringing cost reductions. Upon receiving his Honorary Degree Paul Lindley said: "It is very humbling and a great honour. I accept the degree with an acknowledgement to the exceptionally talented team who work with me at Ella's Kitchen and the support of institutions such as the University of Reading. The University has been part of my Ella's Kitchen journey since I developed my first product and the Knowledge Transfer Centre has been key to supporting and proving our ‘good in every sense'. "The support universities offer industry makes academic and research work projects possible. Often vital areas such as the ones we have benefited from are overlooked as the ability for a small business to undertake such work is out of their financial reach. Working in partnership with a university such as Reading who are leaders in their field brings fantastic benefits to a business." Paul Lindley has been given several awards for his achievements, including Entrepreneur of the Year at the 2011 National Business Awards, Ernst & Young Entrepreneur of the Year 2011 in the London and South Region, as well as the Business Person of the Year at the 2011 Oxfordshire Business Awards. In 2009 Paul Lindley co-founded the Consumer Forum, with a number of other entrepreneurs with high growth businesses all of whom believe that their success is due to the way they approach customer engagement. Paul was presented for the Honorary Degree of Doctor of Laws by University of Reading Pro-Vice-Chancellor for Research and Innovation Professor Christine Williams, during the midday ceremony in the University's historic Great Hall. Professor Williams said: "The birth and growth of Ella's Kitchen is a great example of an entrepreneur working closely with university researchers. The links between the company and the University of Reading began even before Paul launched the company- and have grown ever stronger since then. Paul's campaigning zeal and support for other entrepreneurs can be seen in his work to reform tax systems so that they incentivise entrepreneurs and his enthusiasm for working with student entrepreneurs via the University's Centre for Entrepreneurship. Paul is a worthy recipient of the award of this Honorary Degree." For more information contact James Barr or Pete Castle in the University of Reading press office on 0118 378 7391 or p.castle@reading.ac.uk. The University of Reading is ranked among the top 1% of universities in the world (THE World University Rankings). Among its many areas of excellence, it is internationally recognised for the study of both food and business, with its Department of Food and Nutritional Sciences and Henley Business School enjoying excellent reputations for teaching and research. The University of Reading is a hub for enterprise, working with business and industry and giving them access to the University's wealth of research expertise. Reading was the first university to make Career Management Skills a compulsory component of all its courses, and has one of the largest Entrepreneurship programmes in the country. This helps to provide excellent employees for the knowledge economy and helps graduates to find and continue successful careers. Knowledge Transfer Partnerships (KTP) are part of the Government's leading knowledge and technology transfer scheme, allowing businesses to access expertise available at universities. Businesses can then undertake strategically important projects such as new product development, internal improvements or developing business strategies.